Black Salt is a fine catering service that strives to cater to your needs. Chefs Fabrice Deletrain & Benjamin Voisin create the true culinary experience. Planning an event can be exhausting if you don't have the right resources and partners to work with. Whatever your needs: full-service bar, buffet, sit-down dinner, food & wine tasting menu ... Black Salt begins with your vision in mind and exceeds your expectations. Our chefs use a wide array of personal resources and expertise to cultivate a culinary experience that will truly delight your guests. Whatever the occasion, Black Salt will customize our catering packages to suit all your needs. Need to wow your guests with a certain wine selection, but aren't sure which wines to choose? We've got you covered. From qualified bartenders to a personal wine consultant, we'll get the job done seamlessly. Black Salt provides custom menus using fresh and sustainable products for a wide variety of gatherings. Our entrees and side dishes are specially prepared for your event and tailored to your satisfaction. Chefs Fabrice Deletrain and Benjamin Voisin have traveled all over the world cooking. We are confident that with their skill and passion for producing creative, delectable dishes, you and your guests will leave satisfied. We were beyond impressed and delighted by the efforts of the staff of Black Salt Culinary catering. In November 2015, we invited 120 guests from around the country to our home in the Palmetto Point neighborhood of Fort Myers to celebrate our wedding. French Chefs Fabrice Deletrain and Benjamin Voisin and their staff showed up the day before and helped arrange tables and set up everything for the party. They returned on the day of the celebration very early in the day and set up their bar and food preparation station. Sixteen staff members helped prepare and serve the drinks and the amazing food. As Francophiles, we wanted a French accent for our party and we got exactly what we wanted. The menu included a variety of delicious meats and vegetables. 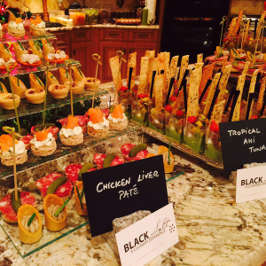 As guests arrived, they passed hors d’oeuvres and glasses of champagne and a full bar was available. As they ventured farther Black Salt had prepared a beautiful assortment of cheeses and other appetizers. The dinner was a buffet and the food was out of this world. We lucked out with the most perfect weather you could ask for and our guests ate throughout the house, dock and pool area. It was spectacular. At the end, they has trays of mini desserts delivered to each table and Ben and Fabrice walked around and served individual crème brûlée at each table. What a wonderful ending to a perfect night. The next morning they returned with a crew of workers. They arrived with a box of the most magnificent croissants for us and restored our home to normal, moving the tables out of our home and replacing them with the usual furniture. With all of our family and friends in from far away it was beyond appreciated to have our home back to normal. Their entire staff was a pure joy to work with from the moment we met them. Everything was not only delicious and beautiful but I must say they made us feel that they loved what they were doing and their staff was also just perfect. All were dressed professionally and acted professionally but they were warm and friendly. I could go on and on about this group of people from Tim (the owner), who was so hands on, Val (Ben's wife) who took care of all the details and Kathy the general manager who coordinated the beverages- they were so great to work with as well. Since Fabrice and Ben are both from France (Fabrice from Paris and Ben from Bordeaux), they bring a real depth of understanding to preparing and serving haute cuisine in the home. They made our special night magical and we’ll have them back for our next soirée. We sing their praises whenever anyone asks about catering needs. I just wish we could do it all over again!